SET 10 PIECES COLOR CMYK UNCOATED. New: A brand-new, unused, unopened, undamaged item in its original packaging. Set of 10 color swatches for digital printing (conversion swatch Pantone C and Pantone TPX, RAL Classic, R AL Design, R AL Effect + creative swatch BASIC and CorelDRAW). 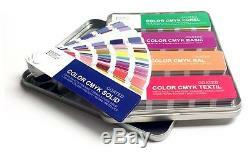 Content swatch COLOR CMYK S OLID Coated and COLOR CMYK S OLID Uncoated. 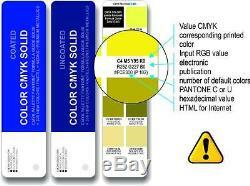 CMYK PANTONE® SOLID - 1.309 colors, each sample on the area of 360 mm2. CMYK PANTONE® 336 NEW COLORS - 336 colors, each sample on the area of 360 mm2. CMYK PANTONE® PASTELS + NEONS - 210 colors, each sample on the area of 360 mm2. 300 colors, each sample on the area of 360 mm2. 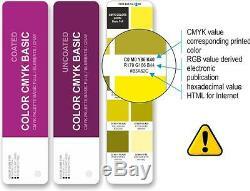 Content swatch COLOR CMYK TEXTIL C oated and COLOR CMYK TEXTIL Uncoated. 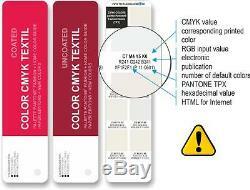 CMYK PANTONE® FHI (FASHION HOME INTERIERS) - 1.1925 colors, each sample on the area of 360 mm2. FHI (FASHION HOME INTERIERS) NEW COLORS. 174 colors, each sample on the area of 360 mm2. 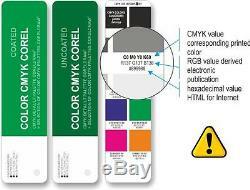 Content swatch COLOR CMYK RAL C oated and COLOR CMYK RAL Uncoated. CMYK RAL CLASSIC - 210 colors, each sample on the area of 360 mm2. 1.625 colors, each sample on the area of 360 mm2. 490 colors, each sample on the area of 360 mm2. Content swatch COLOR CMYK BASIC Coated and COLOR CMYK BASIC Uncoated. CMYK BASIC FULL - 1.970 colors, each sample on the area of 360 mm2. 230 colors, each sample on the area of 360 mm2. 40 colors, each sample on the area of 360 mm2. Content swatch COLOR CMYK COREL C oated and COLOR CMYK COREL Uncoated. CMYK COREL PALETTE - 2.305 colors, each sample on the area of 360 mm2. Under each color pattern, one will find the corresponding CMYK value, the derived RGB value, and the Internet color value. In parent-heses is given the default PANTONE® or RAL color from which the conversion started. 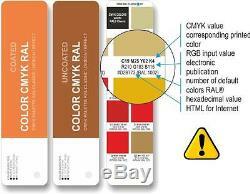 Data source color is based on authorized RGB values and is transformed into CMYK ICC profile FOGRA 39. The product was printed on the machine INDIGO 10.000, paper Colotech+ 250 g/m2 and Amber Preprint 80 g/m2 (uncoated) or Novatech Gloss 135 g/m2. Producer is not liable for any damages incurred using this product out of the conditions above. Ideal for use by professionals (printers , graphic artists) and lay people who come in their profession into contact with the paint and they need or want to know how the color will prescribe (and advertising agencies , PR work). The item "SET COLOR CMYK COATED & UNCOATED PANTONE / TEXTIL / RAL / BASIC / COREL" is in sale since Thursday, February 23, 2017. This item is in the category "Business & Industrial\Printing & Graphic Arts\Printing & Graphic Essentials\Color Guides & Pantone". The seller is "red_baron_us" and is located in Prague, Czech Republic.